A beautiful Kirks Folly brooch of 2 angel sisters, linking arms. One in a pale green enamel dress carrying a basket of flowers, the other in a pale lilac enamel dress with matching headress. Both having enamelled, shimmering wings. Hanging between them is a faceted aurora borealis stone. Made of gold plate. Measuring approx 4cm across x 4cm high. Stamped Kirks Folly logo on the back. Never worn but kept in a KF collection. No box available. A beautifully turquoise and pale green enamelled seahorse with a tiny pale white enammeled one and 2 more old goldtone ones. All swimming amongst crystal encrusted sea grass. Stamped Kirks Folly on the back and measuring nearly 7cm. Never worn but lovingly kept in a Kirks Folly collection. No box available. The largest teddy bear is an angel bear with angel wings. The necklace is mmade of aurora borealis coated crystals and gold tone chains. There are 6 bears in total including the large one and they are all gold tone. Earring drop approx 4.5cm from top of ear wire. SMALL KIRKS FOLLY SEAVIEW MOON CLIP ON CHARM/PENDANT. 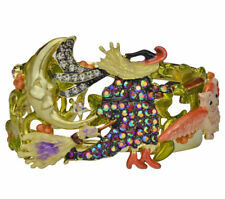 KIRKS FOLLY VINTAGE MORNING GLORY FAIRY BROOCH ! In gold tone the "Morning Glory" fairy is reclined amongst the flowers & morning dew, she is only wearing a pink sash and has large antique rose wings, her hair is follydusted which sparkles around the blue "bell" flowers. There is a Kirks Folly logo piece on the end of the extender and the necklace fastens with a claw clasp. 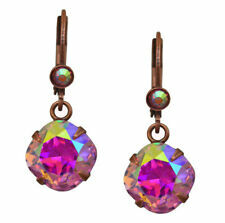 It is made up of round faceted crystals in jewel colours and is sparkly. anywhere along this extender to alter the length. Beautiful earrings. Grab a bargain. Kirks Folly really pushed the boat out on this one! Seven beautiful snowflakes, all different sizes and designs, shimmering cream enamel ones, goldtone encrusted with stunning multi- faceted aurora borealis crystals that catch the light from every angle. Meaduring just over 6cm across and stamped on the back with the KF logo. Never worn but lovingly kept in a Kirks Folly collection. No box available. Kirks Folly Fairy Brooch . Condition is Used. Dispatched with Royal Mail 1st Class. A long since retired piece of Kirks Folly. The secret of the 7 angels watch was amongst the first pieces of jewellery available here in the UK many years ago. This watch has been worn many times and although the goldtone is a bit worn in places, its still a stunning charm bracelet as well as a watch. The watch itself needs a new battery. No missing aurora borealis gemstones or charms. Still has safety chain on. No marks or scratches on watch glass. Will fit up to 18cm wrist. No box available. A stunning piece of Kirks Folly necklace and Earrings set with aurora borealis crystals, silver tone metal. Definitely an occasion piece. Will send signed for. Iconic red shoe earrings. Only worn once and need to be loved. Grab a bargain. Kirks Folly Shimmering Snowflake Brooch - simply stunning. A truly stunning snowflake brooch by Kirks Folly. A six point snowflake adourned with multi- faceted aurora borealis stones that catch the light so beautifully from every angle. Based on silver tone metal and measuring nearly 6cm across. Never worn but lovingly kept in a Kirks Folly collection for many years. No box available. GORGEOUS KIRK'S FOLLY BUBBLES BROOCH. FAIRIES AND BUBBLES. These are in the shape of moon and stars. A crescent moon has three little stars hanging from it. There are little coloured stones. Fun earrings. Grab a bargain. One of my oldest pieces of Kirks Folly. I'm not sure what this was called but had something to do with the sea as there are a shell and boat wheel charms along with cherubs, hearts and stars and a sunshine. Worn a lot so goldtone has worn in a few places and one crystal missing from the crescent moon. The watch itself is missing its glass and needs a new battery but if taken off, you have a simply stunning charm bracelet. Nearly 19cm long. No box available. Kirks Folly Dreamkeeper Dance With The Fairies bag. A beautiful bag with fairies printed onto 100% lilac silk. The inside is lined in lilac polyester and has a zipped pocket. Seed and bugle bead fringe along the bottom and round bamboo handles. Measuring 30cm across and 28cm down the middle. Magnetic closure. Used for a wedding then stored and sadly forgotten. Kirks Folly Magic Castle Pin Brooch Drawbridge Opens - No Box. Condition is Used. Dispatched with Royal Mail 2nd Class. THE NECKLACE HAS LILAC FACETED BEADS WITH ROUND CLEAR CRYSTALS WITH AB COATING. NEW very pretty Kirks Folly Bird Charm. The star has crystals set in it. It can be clipped on a necklace or bracelet. 5 cms long from top of clasp. Supplied in an organza bag. We have a set of three bracelets from Kirks Folly all boxed. All three are the same style but different colours. There is a purple, clear and green one. They are expandable to fit any wrist size . Please take a look at the photos. BEAUTIFUL NECKLACE BY KIRKS FOLLY IN GOLD TONE PAVE SET CRYSTALS WITH LOADS OF SPARKLE IN CENTRE OF NECKLACE IS A HEART. This is a stretch wrist item and is 5/6cms inside as per picture across. Expands to double this. GORGEOUS KIRK'S FOLLY BROOCH. FAIRY WITH ARMS FULL OF 4 TEDDIES. Kirks Folly Brooch. Rare and retired, unused not in original box but will come carefully packaged. Centre enamel roses and two fairies either side with tiny pearls in their wings. Has enamel iridescent shells and a crystal droplet. The backing is filigree. No scratches or tarnishing and all crystals are intact. Height 2" x 1 .5" Width at widest. Stored carefully in smoke free home. 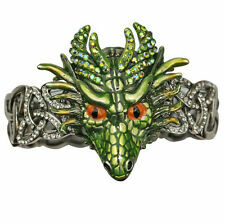 Kirk's Folly Necklace.dragon with chrystal. Condition is Used but good.Dispatched with Royal Mail 2nd Class Large Letter. BEAUTIFUL SWEET ROMANCE PURSE PENDANT. OPENING PURSE WITH LOVELY ORNATE CHAIN. Kirks Folly Aurora Necklace Boxed. total length of this lovely necklace is 50cm. Dispatched with Royal Mail 2nd Class. This is one piece of jewellery from the Rainbow Bridge collection. It is a goldtone anklet with animal and angel charms. The charms are interspersed with rainbow crystals. This is a Kirks Folly Rainbow Bridge goldtone anklet. 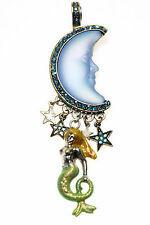 BEAUTIFUL DREAM ANGEL BY KIRKS FOLLY SHE GLOWS WITHIN JUST LIKE THE SEAVIEW MOON. AND CHERUB TISSUE PAPER. THIS IS A LOCKET NECKLACE TO AT PHOTO OR HAIR. Gorgeous large Kirks Folly heart pendant. Beautifully set with clear and Rainbow aurora borealis crystals, the crystals give sparkle and reflect the light. The pendant doesn’t have a chain but the top section where a chain would thread through can accommodate a variety of chain types. KIRKS FOLLY @ QVC -Aurora Borealis Crystal Silvertone Bangle/Bracelet. Condition is Used. Dispatched with Royal Mail 2nd Class. ADORABLE CHERUB ANGEL BROOCH, BY "KIRKS FOLLY". SIGNED KIRKS FOLLY. BEAUTIFUL ANGEL CHERUB BY KIRKS FOLLY IN GOLD TONE. THE CHERUB IS HOLDING ON TO A DANGLE STAR. Rare Kirks Folly Crystal Neclace & Earings Set. I am reducing my jewellery collection and have never worn these pieces. Please take a look at my other items. In excellent condition. The necklace is approx 26cm in length and extends to approx 30cm. The earrings are approx 4cm. The larger drop crystals are clear and all the other smaller crystals are aurora borealis. Genuine Kirks Folly originally purchased from QVC. A very pretty, sparkly set from a smoke free home. STUNNING SEAVIEW MOON GODDESS IN A VIOLET. Kirks Folly Sealed with a Kiss Crystal Embellished Earrings. Exquisite earrings, boasting a romantic 'kiss' design embellished with clear and aurora borealis crystals. KIRKS FOLLY CLEAR CRYSTAL BEADED NECKLACE AND TWINKLE FAIRYSSE IS WEARING A SILVER DRESS AND HAS PINK PAVE SET CRYSTAL WINGS. YOU CAN ADJUST THE NECKLACE FROM 17"TO20".